Our industry hinges on great ideas. And, while the design community is great at talking about technique, I don’t often find advice on critical thinking and problem solving skills—the very skills that, I find, help lead to great ideas. It’s possible that I’ve noticed this gap because, besides being a designer, I’m also an avid chess player. For me, chess is a powerful exercise in creative strategy when faced with nearly infinite permutations. As such, chess makes me a better designer. Why would an area of the brain devoted to the recognition of faces be activated in chess experts when they view a chess game? To recognize a face, we need to see more than the eyes, nose, and mouth. We must analyze the spatial relationships between all these features. Similarly, an understanding of the spatial relationships between game pieces is crucial for winning at chess. In other words, the area of the brain responsible for facial recognition becomes active during a chess match. That’s because chess, like facial feature recognition, engages our brains to analyze spatial relationships to communicate information to our brain. Spatial recognition is used everyday when it comes to layout and composition—and while I completely agree that there’s an incredible amount of intuition happening during the design process, we wouldn’t have the ability to process those thoughts into tangible deliverables without some good, old-fashioned brain power. More specifically, though, how is chess like design? Here are some examples. How does moving piece X now affect Y later? Chess teaches future-proofing in a unique way. Like setting up your pieces for an excellent defense while still putting pressure on your opponent, being able to provide smart design choices early on is proactive and beneficial to everyone on your projects. For example, designing a site with mobile in mind will make responsive design easier and less burdensome on your development team, leading to better use of time and budget for the project. To this day, chess has not been “solved,” meaning there is no guaranteed way to win based on a standard set of moves. It’s an exercise in creative problem solving at its finest! How players approach a chess game is going to be unique every time. Similarly, no two designers will tackle a visual problem the same way. Design is extremely subjective and, oftentimes, open to interpretation, with varying strategies depending on the problem you’re trying to solve. - Solving the main objective: getting your opponent into checkmate. Design is similarly orchestrated. A designer’s ability to predict how the client and fellow team mates will react to the work is crucial for delivering an effective end-product. There’s the same kind of back and forth too—revisions are based on client reactions, and it all has to be done under time constraints to meet the deadlines. Strengthening your ability to concentrate will make these goals and tasks much easier to hit on time at higher levels of quality. French chess master Andre Philidor once said: “Pawns are the soul of chess.” Pawns are relatively immobile pieces that dictate the movement of other pieces on the board. Their survival provides immense support in the game of chess, and building a strong pawn structure is paramount for protecting your pieces. This is a hierarchy skill - something designers use everyday in their work (typographic, color, size…). 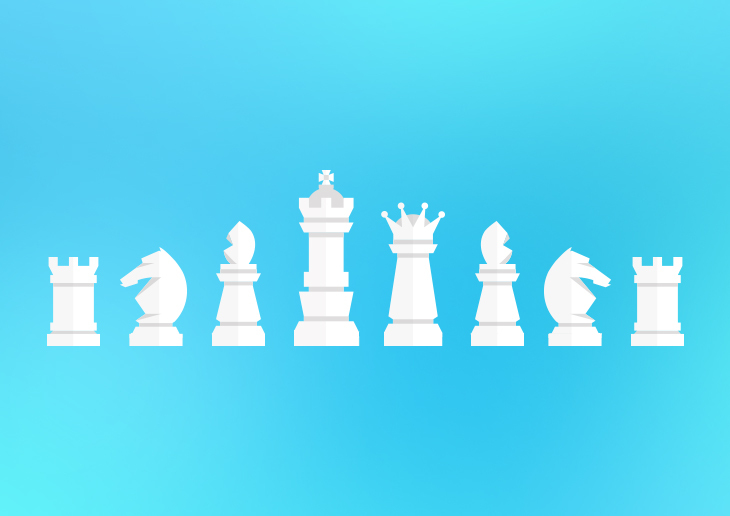 Both design and chess require the ability to identify patterns and weaknesses—and much like the pawns of a chess game, design hierarchy provides a foundation for successful design. And hey, chess is fun! Like design, chess can be an extremely fun and fulfilling on its own! Chess.com provides a rating system and gets you playing people all over the world. Brooklyn Castle is a fantastic documentary on chess in schools.